The Griffin Navy Issue is a Electronic Counter Measure frigate. Compared to the standard Griffin the Griffin Navy Issue has a significant buff to hull, armor and shield points; along with extra powergrid and almost twice the capacitor. The Griffin Navy Issue also has a higher increase in jam strength per level of Caldari frigate and a damage bonus to hybrid turret; which is reflected in swapping one of the launcher high slots for a turret high slot. The -85% role reduction to ECM Jammer activation cost means that jammers actually use less cap than a pilot with lvl 5 Caldari Frigate in the standard frigate. This does come at a cost though with the major negative of the Griffin Navy Issue being its' secondary role bonus of -85% penalty to ECM optimal range and falloff. This means the Griffin Navy Issue can't pull off the standard Griffin tactic of staying at long range while jamming enemy ships. Instead the Griffin Navy Issue is envisioned as a close in brawler utilizing blasters with the jammers used to mitigate enemy ships. The extra capacitor and decrease in jamming costs also gives the ability to fit tackle and propulsion mods while remaining somewhat cap stable (depending on capacitor skills). 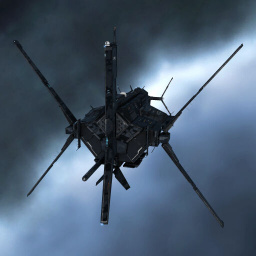 Considering the cost of the Griffin Navy Issue and the complexity of jamming tactics (knowing which ships to jam and when) it is suggested that new players experiment with the standard Griffin until they have built up both their character and game skills before attempting to fly the Griffin Navy Issue. These skills will improve your EWAR effectiveness when flying a Griffin Navy Issue. Caldari Frigate - Affects both ECM effectiveness and hybrid turret damage, a lot. Long Range Targeting - 5% Bonus to targeting range per skill level. Requires CPU Management Level 2. Frequency Modulation - Increases the falloff distance of your ECM modules by 10% per level. Requires CPU Management Level 3 and Electronics Warfare Level 2. Long Distance Jamming - Increases the optimal range of your ECM modules by 10% per level. Requires CPU Management Level 4 and Electronics Warfare Level 3. Electronic Superiority Rigging - This will reduce the shield penalty incurred by your ECM rigs. Requires Jury Rigging Level 3 and Mechanics Level 3. Signal Dispersion - Increases your jam strength by 5% per level. This skill requires CPU Management 5 and Electronic Warfare Level 4. If you have decided that you really enjoy being an EWAR pilot this is a great skill to work towards, but it certainly isn't required to have fun flying ECM in fleets. See the EWAR Guide and ECM Guide articles for more information. See what target you engaging and pick proper ECM module. Pick proper ECM modules against your target. PvE - Not recommended as the Griffin Navy Issue lacks damage projection and often relies on costly tank (such as burning cap charges for an ancillary shield booster). With the ECM changes from the October 2018 Update, using ECM no longer stops a jammed target from targeting you, which strongly limits the usefulness of ECM on this ship for solo PvP. Against larger ships, i.e. cruiser size plus, you'll need to get in under the guns and orbit to maintain a good transversal. To get close either set the range by waiting at a 'zero' point eg. the beacon of faction war plexs or spiral in on your enemy rather than flying directly at them. Against smaller ships, i.e. frigate and destroyer size, you still need to maintain close range in order to effectively project your blaster damage. Avoid ships that can readily control range against you (e.g. scram/web AB kiters, MWD kiters that are already inside a plex, etc.) in favor of ships that lack range control (lone Punishers, MWD brawlers). If fighting multiple enemies consider jamming non-engaged targets rather than the one you are currently damaging; especially if they are repping your target or applying higher damage to you due to your lower transverse compared to them. PvP - Fleet - Not recommended as the Griffin Navy Issue still has a fairly weak tank when primaried in fleet combat, and no ability to project jams or damage from range. More information on tactics and matching jammers to targets is in the ECM Guide. This page was last modified on 9 January 2019, at 19:00.